Despite the obvious quality of her work as an etcher, artist Bertha Hosnung has slipped into the netherworld of art history, through a sieve of unnecessarily open weave; the history of art catches only Big Fish. Our Community Collection is indeed a critique of that restricted view of what art is and who decides. How we acquired this work is also a mystery: other than its accession date (1948) and a small label on the back of its frame hinting it had come from Marshall Field’s gallery in Chicago, we can only speculate who bought it and what their artistic criteria may have been. If nothing else, history has shown their eye to have been good—and our fortune equally good to own and be able to share it. Bertha Hosnung’s subject was the Norfolk Bridge at Shoreham-by-Sea, on the English coast in what is now the county of West Sussex. A suspension bridge designed by civil engineer W. Tierney Clark, it opened in 1834 as a toll facility over the River Adur and stood until dismantled and replaced by something far less grand in 1923. 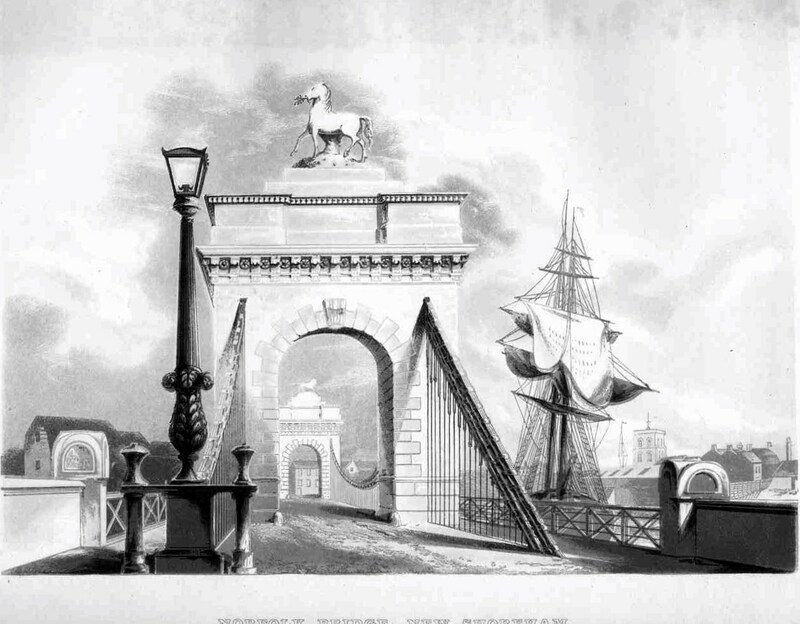 But for eighty-nine years, the fearless lion and noble horse atop each triumphal arch greeted travelers to and from what was then the Borough of Shoreham. 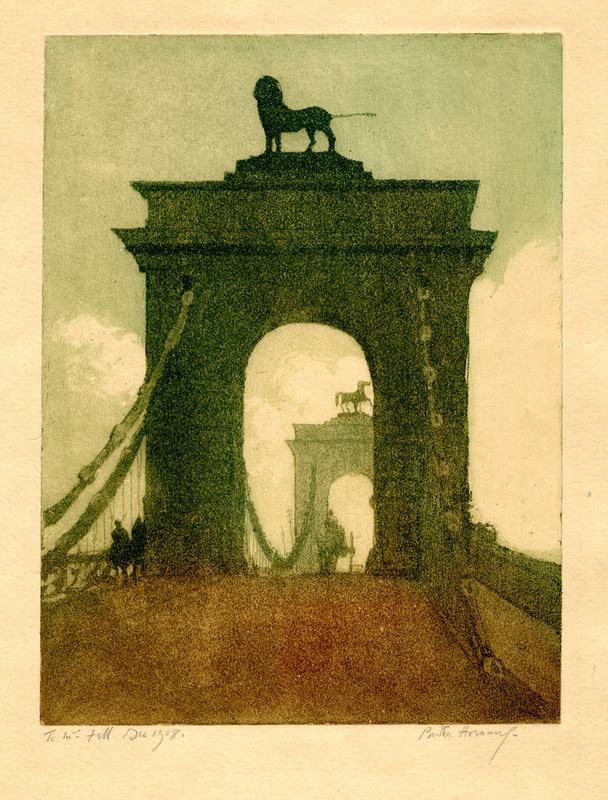 Hosnung’s composition and the grainy texture of aquatint—as well as an inscription dated December 1908 “To Mr Fell”—seem to confirm its Edwardian character. For contrast, consider the more photographic representation in an engraving made shortly after its opening nearly a century earlier. Artistic taste has shifted and engineering grandeur has been replaced with utility. By agincourtiowa in Landscapes & Livestock, Uncategorized on Friday/03/May/2013 .